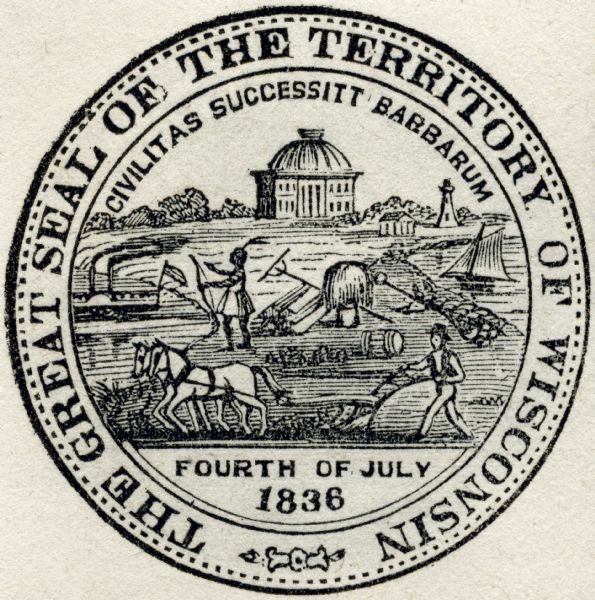 Territorial seal of Wisconsin. There is a farmer in the foreground plowing behind horses, a Native American apparently heading west, a river steamboat and a lake schooner. The first Madison capitol building is in the background and there is a lighthouse at the upper right. The seal also bears the phrase: "Civilitas Successitt Barbarum" and the date Fourth of July, 1836. First Madison capitol was built in 1838. Wisconsin Territory was established July 4, 1836.